Buy one, get two for free! It’s your life. It’s your tv! We provide a diverse range of high quality products. We will never let you down. This is what you want right now. Dive in a new world of happiness, with products fulfilling your dreams! Our programme will entertain you and help you improve yourself. Cause it is always about making it better. 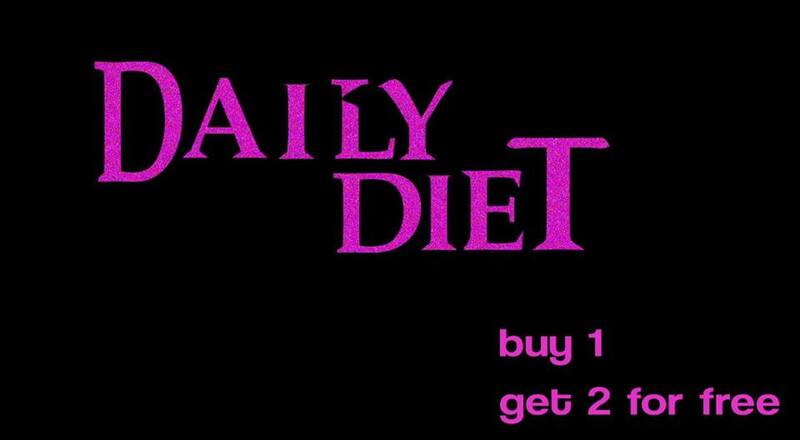 This is DAILY DIET. This is your tv! Sejma Prodanovic and Lena Violetta Leitner set an exhibition that deals with consumerism, marketing, videos, body image and shopping channels. “DAILY DIET” analyzes the complexity of our contemporary society in various ways by digesting the aggressive world of information and advertisement. The different levels of fiction and reality start to mix, involving the visitors as well. Sejma Prodanovic makes a serial of simple linear drawings in ink with the goal to translate different visual languages from the world of mass-media in an individual and direct way. Lena Violetta Leitner shows a two-channel video that deals with the absurd world of shopping and consists of found footage and a documentation of the artistic process of Sejma and Violetta. works with discarded material and reinterprets their use with painting, printmaking, drawing and installation. Recent exhibitions are: „Using images“, Cultural Center Grocka (2015), „Daily Drawings“, Gallery DKSG Belgrade (2013), „I saw unseen“, Gallery Dom Omladine Belgrade (2012).